This beautiful Dream Catcher is made for us by Native American Artist Patricia Pacheco. Patricia's father is Ojibway (Chippewa) and her mother is from the Laguna Pueblo. She has made a few of these wonderful dream catchers for us. They have a horse and raven fetishes in the web as well as turquoise red coral stone chips. 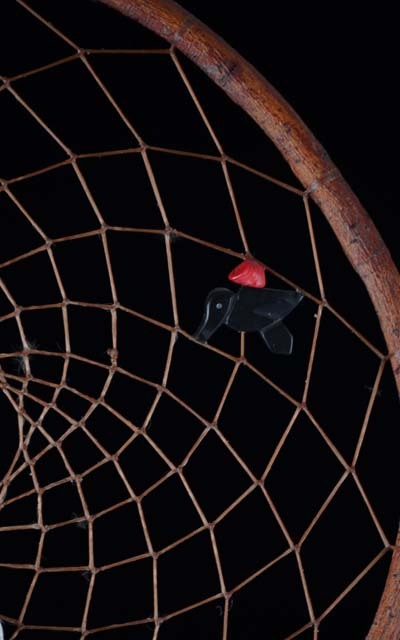 The bottom of the dream catcher is adorned with duck feathers.. The horse and raven may vary in color and material to that picture slightly as the artist uses different stones as she sees fit. The red coral is from the sea, the turquoise is from the earth. Together they help protect the dreamer. The feathers on the current dream catchers we were sent have phesant feathers not duck feathers. We will update the photo soon.